Ontario Premier Kathleen Wynne, right, met with several from the Canadian auto industry to talk NAFTA and trade. 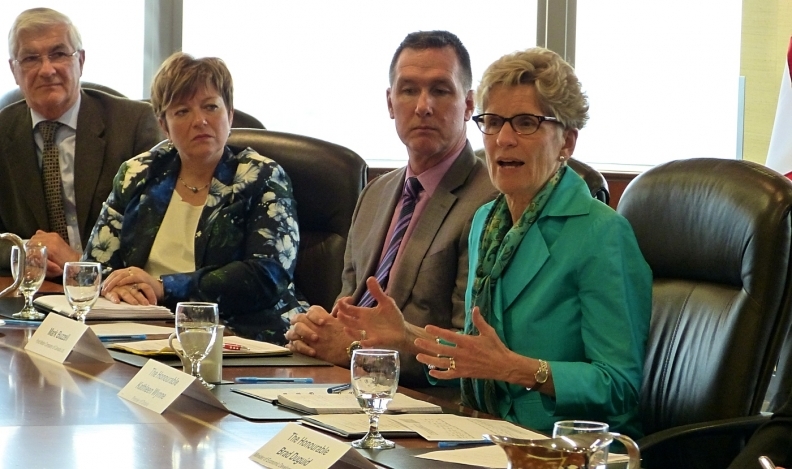 TORONTO -- Ontario Premier Kathleen Wynne met with Canadian automotive executives and labour leaders in Toronto on Friday to strategize about how best to approach a potential renegotiation of the North American Free Trade Agreement. The group, which also included Minister of Economic Development and Growth Brad Duguid, discussed the importance of emphasizing the interconnectedness of the North American automotive industry. The approach has emerged as a key tactic in countering trade pressures from the United States government. Not only has President Donald Trump called for a tweaking of NAFTA, at the very least, the U.S. Congress is also considering a border tax that could affect both the supply chain and final sticker price of vehicles. “Buy America” policies being considered by multiple states — including New York, a key trade partner with Ontario — are an additional pressing concern. Maintaining product affordability and economic sustainability were two important aspects of industry interconnectivity raised in the talks. Wynne said that a primary purpose of the meeting was to ensure that government and industry are aligned in their objectives. Duguid added that he has so far encountered understanding on this issue in discussions with his American counterparts. “There’s this perception that we think Americans don’t know as much about Canada as we know about the U.S.,” Duguid said. “They are very aware that Ontario in particular, and Canada, is for the most part their number one international customer. We’re crucial to their economic vitality, and we’re crucial to jobs in the U.S.
“There are about nine million jobs [across all industries] in the U.S. that rely on that unfettered border, and that’s the pitch that we make and will continue to make to our counterparts to the south,” he said. Flavio Volpe, ‎president of the Automotive Parts Manufacturers' Association, called the meeting a “good, substantive discussion” on how to communicate the importance of the industry’s interconnectivity during any upcoming talks. He added that Mexico was also discussed during the meeting, with an eye to the significant increase in Canadian investment there in recent years. While the possibility that the United States may attempt to negotiate separate trade deals with Canada and Mexico has been raised, Volpe said that Canadian stakeholders see the tripartite arrangement of NAFTA as being an important one for the industry at large. -- Linda Hasenfratz, CEO of Linamar Corp.